In my infinite wisdom, I, Effing Feline, chose another ten sentences from Ed Hoornaert’s The Trial of Tompa Lee. In last week’s snippet, Mr. V’s lowly heroine, Tompa Lee, has been framed for terrorism on an alien planet. Dante Roussel, a Space Navy policeman, has handed her over to Shon justice. The Space Navy is famous for leaving no sailor behind, and the sailors hate to abandon Tompa to be slaughtered by aliens. But only one of them is willing to disobey orders to fight at her side against 300 accusers. Magenta: the color splashed across Dante’s mind. Code Magenta meant an order of ultimate importance he must instantly obey, no matter what—but magenta was also the color of blood, of life and of death; of Tompa’s death. Doing this to an innocent girl wasn’t fair. The confusion and uncertainty of the last few days crystallized into a vivid, magenta decision. Dante dashed down the steps, chasing after Tompa Lee. Shouts arose even before he reached the powdery dust of the arena, but he kept running, expecting with every step a sudden, burning agony to terminate his dash. Ignoring a Code Magenta was an act of mutiny. He didn’t dodge or weave. He owed the Navy a clear shot at his back even more than he owed Tompa Lee her safety—or, to be more realistic, the small grace of not dying alone. Effing Feline here again. Brave guy, eh? With such sterling bravery, Dante is obviously part cat. Or at least a cat lover who hates, loathes, and despises dogs! Make sure you read the snippets by other great weekend writing warriors. Finally, I found this on the SFR Brigade group and just had to share it with fellow writers. If you aren’t into science fiction, substitute your own genre. I love it when heroes disobey orders and do what’s right. Great writing here, Ed, and I enjoyed the insight to Dante’s character. One can never go wrong with American readers by having your characters feel that obeying orders is the wrong thing to do. It resonates with something deep in the American weltanshauung. Well that evens the odds a bit. Liked the way you worked in the different meanings of magenta. I like that too, even though, strictly speaking, blood isn’t magenta. I think I love Dante… His selflessness is amazing, even if he doesn’t think he’ll be successful at saving Tompa, the fact that he is willing not to let her die alone. Really great snippet. Holding my breath to find out what happens… ok, I will take a breath or two until next week but I won’t enjoy it. Since he’s the romantic lead, you’re supposed to love him. Note, however, that The Trial of Tompa Lee is science fiction romance, but science fiction with elements of romance. Wow de Wow. What a hero. And your writing is truly supreme. Why thank you. Dante is probably my favorite hero I’ve written. As soon as I saw that graphic, I fell in love too. Oh, he’s in such a tough spot. Hope he makes it out alive. I really like him. The trauma in Dante’s past makes him identify deeply with Tompa’s situation, and also contribute to his willingness to break the harness. Good for him! Great action. Great action writing! Nicely done on the vivid details with magenta. Sometimes a touch of stream of conscious, or free association, does wonders for getting into a character’s head. That was an intense secene. Great way to add some instant conflict and make us wait to see what happens next! When writing this, I really felt for poor Dante. The Space Navy has been his life, and now he’s abandoning it — not on a whim, though. His motivations run deeper than that. Oh geez, what will they do to Dante for going anti-magenta? Great pacing, excellent snippet. Well, they have to catch him, first. I never would have thought of magenta as a terrifying color…until now. Great snippet! I’m thinking of getting my car repainted magenta. Maybe I should pick a more soothing color, though! So, I’ve been known to tell my child that rules are at times meant to be broken…and see here, a fine example in black and white : ) Love this scene Ed! As I responded to Paula Millhouse above, breaking the rules is very dear to American hearts. I love how Magenta serves as a motivating code to follow as well as being ironic that it’s the color of blood. It plays a great role here, and I agree with Millie’s comment about how rules are sometimes meant to be broken. Yes, magenta turned out to be a nice little symbol. I love it when people do what’s right in spite of everything. Do you think Tompa will appreciate what he’s done? Aw, he’s a real hero! I wouldn’t be surprised if he turns out to be all cat. A shifter perhaps? With every snippet, this book moves closer to the top of my virtual TBR pile. He’d be very glad to here that, because deep down that’s what he wants to be–not merely a cog in the navy’s machinery, but a hero. I love this hero already. Great snippet. A hero! One with a great name, to boot. Love the snippet. Sometimes a name helps to define a character. That’s how it was with ‘Dante Roussel’. Huh, I don’t know how brave that is. He wants to make a gesture, but he expects–even wants–to be killed before he can help much. Brave but silly, perhaps. Well, that’s not what I was aiming for in this passage, but yes, that describes Dante as well. You don’t see it in this excerpt, but the wound in his past is a literal wound: brain damage. He’s mostly fine, but before his injury he was a ship’s captain, and he yearns for his former glory and heroism. I love this guy’s code of honor, ignoring the command but giving the Navy a clear shot at him if they want to take it. That detail says a lot about him, really a well done excerpt. I have to admit, I really like that business about giving them a shot at his back. Honourable – that’s the first word that comes to mind. A the little details – making it magenta – not red. 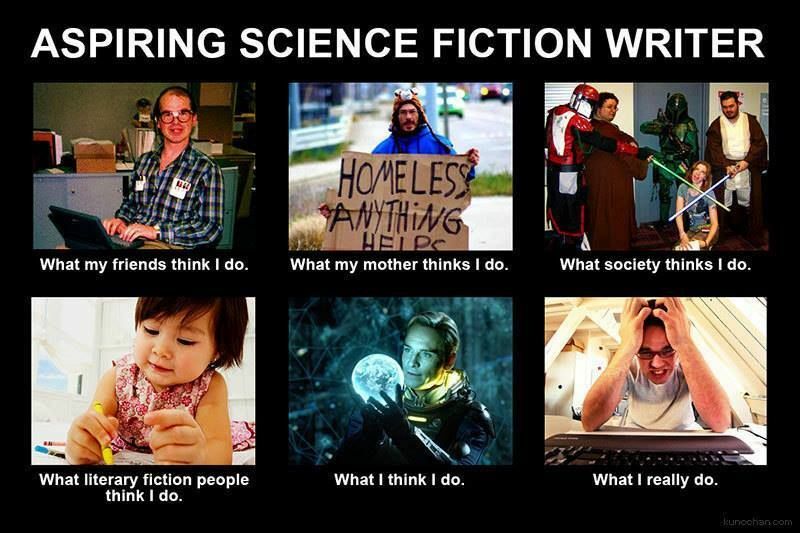 And I love your Aspiring Sci-fi Writing photo – lol. Yes, honourable is the perfect word–and the Canadian spelling is perfect, too. He’s from Montreal. Effing Feline, I agree completely, that is incredible bravery. Love the repetition of magenta. It really adds to the scene. Great job. Powerful snippet, Ed! And I particularly like the imagery of the word “magenta”. Excellent choice.